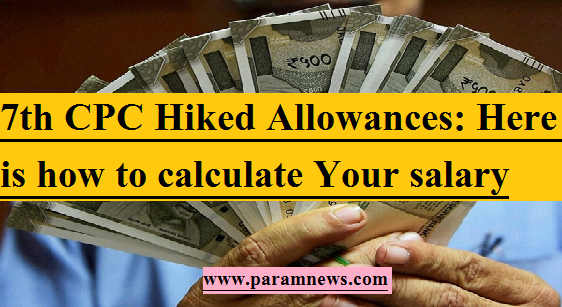 7th Pay Commission Hiked Allowances: The Union Cabinet chaired by the Prime Minister Shri Narendra Modi approved the recommendations of the 7th CPC on allowances with some modifications. The revised rates of the allowances shall come into effect from 1st July, 2017 and shall affect more than 48 lakh central government employees. However, still there exist issues in terms of disbursement of arrears and allowances. It has been observed that the implementation of the commission’s recommendations earlier were very time consuming. However, 7th CPC recommendations have been implemented within six months from the due date. On the other hand, the key aspect is that how efficiently and timely the disbursements of the allowances are being made to the Central employees. Generally, when Central pay commission is implemented, it takes about two years for the disbursement of all allowances. As far as the salary structure is concerned under 7th CPC, the present system of Pay Bands and Grade Pay has been dispensed and a new Pay Matrix is introduced. In this regard, separate Pay Matrices have been drawn up for Civilians, Defence Personnel and for Military Nursing Service. The CPC has introduced index of rationalisation for arriving at minimum pay in each Level of the Pay Matrix depending upon the increasing role, responsibility, and accountability at each step in the hierarchy. In this context, CPC has enhanced the minimum pay from Rs 7000 to 18000 per month and the starting salary of a newly recruited employee at lowest level is now Rs 18000 whereas for a newly recruited Class I officer, it is Rs 56100. Under 7th Central Pay Commission (CPC), the salaries of the employees are obtained by multiplying the existing basic pay by a factor of 2.57 and the figure so arrived will be added to all the applicable allowances such as Transport Allowance (TA), House Rent Allowance (HRA), Medical Allowance, etc. 7th CPC has come into effect since Jan 2016 and is presently running in its second year. The recently approved modifications by the government in regards to recommendations of the 7th CPC on allowances are going to be effective since 1st July 2017. It is expected that all the disbursements will be made gradually by the Central government by end of this year.